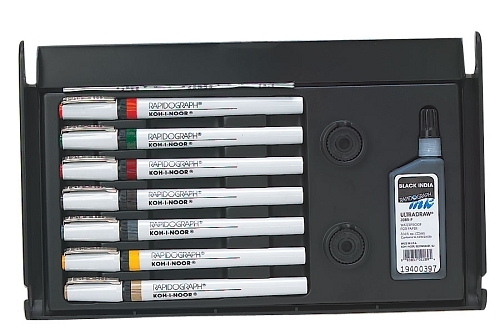 Rapidograph Slim Pack pen sets provide storage for your technical pens in a convenient hinged-lid case with push button release. Seven pen set includes one each of0.25/3x0, 0.30/00, 0.35/0, 0.50/1, 0.60/2, 0.80/3, 1.20/4. Set also includes a bottle of Koh-I-Noor waterproof,black India drawing ink and nib keys. Also available individually and in a 4 pack set. 130 points will be rewarded when you are logged in to your account and buy this item.